High Output 6,400°K lamps simulate natural sunlight and are ideal for cuttings or vegetative growth. Some horticulturist's choose 2,700°K for budding and blooming. 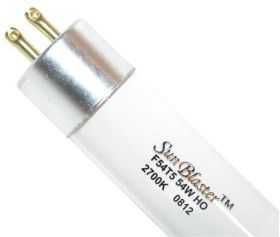 SunBlaster's T5 HO lamp produces a light of much greater strength than a conventional tube and, as a result, the energy input into the area being lit is much greater and the light penetration is far superior to anything previously available.